into the bookbinding world and the life-changing experience that studying at AAB brought to her. binding, all sorts of things. What was your path into bookbinding? to Coptic binding. You hear people talk about being bit by the bug, and that’s what it was like. more about sitting at a computer and working with software and spreadsheets and databases. really moving forward in binding. In your MLS program, did you take bookbinding classes? Yes, there were classes in library school that focused on conservation. They were pretty basic. consistent hours at a bench. What kind of bookbinding skills did you get from Penland? worked with these more complicated sewing structures. It was fantastic, a great experience. I think is really important with fine binding because it is so meticulous. I have to admit you’ve learned in some beautiful places and had some really good teachers. encounter very many people who are territorial about it. environment, no matter what your level of experience. I feel like I get that at Standards too. I can totally understand that. I was so intimidated during some of the opportunities that I had. But then you learn and it’s totally life changing; it totally changed my life in a good way. moved to Michigan and opened a studio. Is that when you started full-time bookbinding? find ways to balance my own work with the responsibilities I have at AAB. 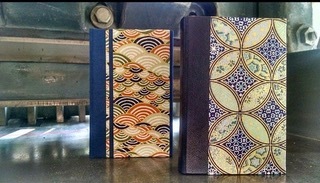 of the job at AAB, but I’m planning to continue to work toward my diploma in Fine Binding. my own content and creating design bindings. here.” It was just beautiful to see how meaningful this experience can be for people. someone like me who is interested in going - how can I make that happen for myself? annual Fine Binding scholarship which provides $3000 toward tuition and housing. what it’s all about and see that it’s completely worth all of the effort in getting here. the conservation program was dropped and was replaced by another. Program which offers a bit of everything. Some students come to it with very little experience. What are the requirements for completing the diplomas? up as they are going through the program. 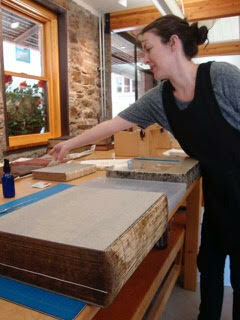 is comprised of three members of the bookbinding community who evaluate their bindings. lot of work! Our diploma students are extremely dedicated. DeGolyer Triennial Exhibition and Competition for American Bookbinding. throughout the world. A lot of the prize winners and participants were from outside of the U.S. It was a lovely thing to see all of the international participants.